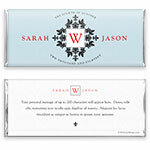 This sophisticated monogram wrapper will bring a touch of elegance to your reception. Design: Decorative monogram initial on plain background. Personalization: Front initial, names and date, back title and message.